Can you incorporate your favorite getaway destination into your Columbus-area outdoor living space? Somewhere on a traditional suburban street in Dublin, OH, there is a screened porch that transports the homeowners back to that sweet, intimate cabin in the woods where they spent so many nights in front of the fireplace. Yes, it’s a screened porch. With a stone fireplace. In Dublin, Ohio. And they love it. The clients asked Archadeck of Columbus to create a cozy, warm, cabin-like screened porch to take the place of an old wooden deck. So this Dublin outdoor living project falls into the category of deck-to-screened-porch conversions. Looking at it now, you won’t think, Oh, that used to be a deck. Instead you’ll think, I want a screened porch like that! To begin the construction, we removed the original deck and built the new structure from the ground up. For the floorboards and stairs, the homeowners chose TimberTech Terrain composite decking boards in the brown oak color. These boards are low-maintenance, durable and texturized to display the beauty of real wood graining. The selection is both beautiful and practical because the material resists mold, mildew and moisture damage —great for a screened porch! Looking up, you can see that the porch roof has a shallow pitch to avoid hitting the second-story windows overhead. We installed a standing seam metal roof that works well for this pitch and also has the advantage of being a “cool roof,” meaning it is light in color and won’t absorb heat from the sun. Of course, the centerpiece of this project is the traditional wood-burning fireplace. While the appearance is that of aged brick, perhaps reclaimed from an older home, we actually built it with (new) concrete stones. It definitely contributes to that cabin-in-the-woods vibe we wanted to convey. Inside, the fireplace’s granite hearth is nestled amidst cedar and pine. The mantel is cedar, as are the screened room’s posts and beams, while the ceiling is tongue-and-groove pine that will be painted. Outside, you can see the cedar trim, posts and beams and cedar skirting with a small door to access a storage area under the porch. There are two outside storage doors, one on each side of the fireplace. The overall effect is that of a cozy cabin in the woods, and the homeowners can visit their remote cabin getaway any time just by stepping from the house onto the screened porch. This fireplace will warm many a chilly Ohio evening. If you have an out-of-the-ordinary escape destination in mind and want to incorporate it into the outdoor living space at your home, contact Archadeck of Columbus for a design consultation today. You can reach us at (740) 879 – 3730, or email us at westcolumbus@archadeck.net. Author archadeckofcolumbusPosted on August 2, 2017 August 4, 2017 Categories Archadeck of Columbus, Outdoor living, Outdoor Rooms, Screen Porches, Screen Porches Columbus OhTags Archadeck of Columbus, Columbus OH outdoor fireplaces, Columbus OH Screened Porch Builder, Columbus porch builder, Rustic Screen Porches, TimberTech Terrain composite deckingLeave a comment on Can you incorporate your favorite getaway destination into your Columbus-area outdoor living space? Author archadeckofcolumbusPosted on June 22, 2017 June 22, 2017 Categories 3 and 4 season rooms, Archadeck of Columbus, Porches, screen porch, Screen Porches, Screen Porches Columbus Oh, Screened Rooms Columbus OhTags Archadeck of Columbus, Choosing the right connection for your Columbus OH screened porch, Choosing the right roof style for your Columbus OH screened porch, Columbus porch builder, Gilbert and Bennett Manufacturing Co., History of the screened porch, outdoor living, Screen Porches, Screen Porches Columbus Oh, Screen Porches Columbus Ohio, Screened Rooms Columbus OhLeave a comment on Say goodbye to the screened porches of yesteryear! 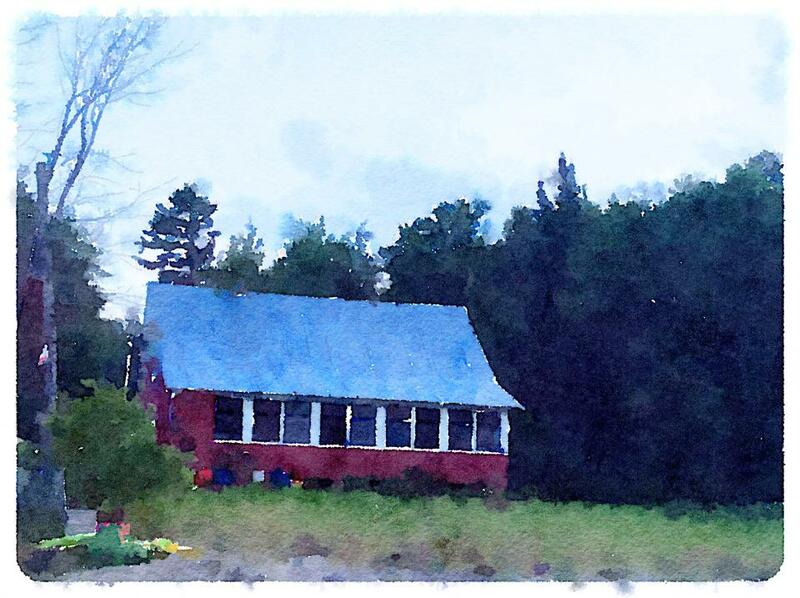 Back in the early 1940s, my grandparents built a cabin on a river and it had a screened porch that ran across the entire length of the side of the house facing the water. We ate out there, played cards, kept an eye out for wildlife and spent countless hours just rocking in chairs watching the river flow by. We all loved that porch and by day it was the center of our indoor activities. Looking back on it though, the porches we build today are in another league entirely. First of all, mosquitoes were our unrelenting enemy all summer long. It seems like we were always patching up a hole here or there and yet, every evening we were still slapping at them and reaching for the bug spray. Today we use weatherproof flexible fiberglass screening. They seal with a rubber strip that goes all around the perimeter and all of them are much more robust that the staple-gun screens of the past. No more worries about screen rips and dents during the post-dinner wiffle ball match. I can’t tell you how much I dreaded it when my mom would say it was my turn to sweep the porch. We were always tracking in sand, dirt, and grass and it used to get down deep into the grooves of the plank flooring. We kids were also pretty hard on it in terms of spilling things and dragging furniture across it. Today I work with a flooring options that are much more robust, attractive and easy to maintain. What I would have given to have had a floor that locked tightly together so I wasn’t having to work the sand out of all of the grooves and nail indents! I would have replaced that floor with with a composite in a heartbeat. In addition, bugs would easily make their way up through the floor boards. Today, we simply put a screen below the porch planks and that keeps the bugs from joining the party from crawling in that way. In my head I can still hear the slam of our screen door. Boy it was loud. It smacked against the jam and reverberated through the whole house. The doors we use today shut quietly and stay shut. They don’t have to be replaced regularly because of warping or easily torn screens and they do a terrific job of keeping the bugs out. We probably would have picked one with a built in dog door for our German Shepherd, Sam. I loved the rustic furniture of that cabin, but we only used it seasonally. My favorite part of the modern screened porch is that you can build it, decorate it and add amenities like fireplaces and televisions much like you would any other room of your home. It is essentially a more relaxed, casual room addition to the rest of your home. Rough and tumble has its own charm, but these days I like relaxing under the ceiling fan with the surround sound audio system. I think my grandmother would have liked that too. It’s spring and a homeowner’s thoughts turn toward the yard: making it look beautiful and spending more time in it. But homeowners are also practical people. They know that soon the bugs will arrive and some days will bring rain– that’s when they consider adding a screened in porch or sunroom so they can enjoy more carefree time outside. Real life takes many forms. Often it looks like a playful child with a stick or a ball. Sometimes it’s an excitable pet or the occasional destructive storm. With that old-style construction, it seems like no time at all before the screen crimps or tears and needs to be replaced. Before that can be done, the trim has to come off. Ugh! Archadeck clients have the same kids, pets and storms, but they have a much more convenient way to keep their screened porches looking sharp. We use a weatherproof, flexible fiberglass screening that isn’t easily crimped or destroyed. We also use framed fiberglass screen inserts. These inserts hold the screen in place with a rubber strip squeezed into a channel around the perimeter. Each insert screws into an opening on the porch for easy repair and replacement. A local company makes our screened inserts and they come in six different colors. This makes it easy to match them to the colors on the house and porch. The screen itself is a patented product called Screen-eze® and is available in two strengths. Their top product is incredibly strong—try throwing a baseball at it! The second option is also very robust and can support a 10-foot wide panel. Screen-eze inserts come in standard sizes or we can build them on site to create the perfect size and look for the job. Custom projects take a little longer, but customers love the results. In addition to installing screened inserts, Archadeck also installs screen doors—don’t ever buy a wood door for a screened porch. An aluminum door is sturdy and won’t warp. They will typically be made with an aluminum-framed screen insert for easy maintenance. The year in review takes a bow as Archadeck of Columbus explores the top 10 design trends in screened and open porch designs; the final installment in our design trend series for 2013 and beyond. As we look back at the year in review, porches were hot! Screened porches and open porches were very popular in 2013. We see that trend continuing into the New Year as well. The number one reason homeowners love porches is because they are a functional and beautiful way to provide shade in your outdoor living space. The need for shade is a necessity in many cases, especially in yards facing South or West. In many cases, porches are a way to allocate a more permanent shade structure than the use of an awning or shade curtains in an outdoor living space. #1) Paver flooring used in a screened porch setting – This is what as referred to as a “screened patio”. These spaces have all the function and appeal of a porch with the only difference being the grade of the structure and floor medium used. Paver and hardscape patios can be the foundation for a wonderful screened or covered/open porch addition. These outdoor living spaces are often built on the ground or at a lower grade than traditional screened porches, but can also include an elevated design. #2) Wraps are very popular – Wrapping consists of covering areas such as posts with a more aesthetically pleasing wood. 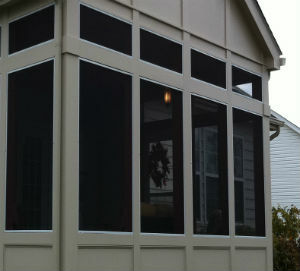 We often wrap areas that are visible in your screened porch with cedar or paulownia to give the space a rustic appeal. Custom trim is also widely requested. The open rafter detail of this porch gives it a rustic feel and the warm wood tones the homeowners used further the charm. 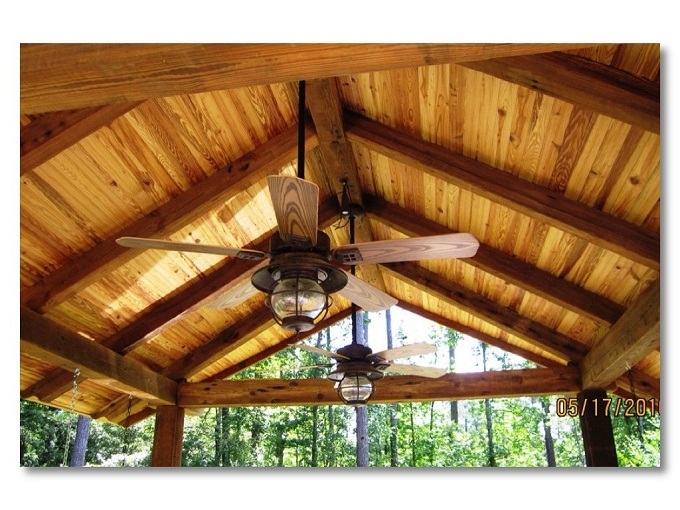 #3) Cathedral ceilings are a must – Cathedral ceilings within screen porches interior are a hot commodity. The pitch of the roof dictates ceiling height and since our most utilized roof styles for screened porches in the Columbus area are the gable and hip, it sets the stage for a cathedral ceiling. Cathedral ceilings lend an open airy feel to your porch interior and create a sense that the space is larger than it actually is. Keep in mind, if conditions require, we can do a flat roof as well. #4) Exposed rafters – Nothing adds character or style to a screened porch interior quite like exposed rafters. With the simple act of leaving the ceiling of your porch open (exposed), you create a panoramic focal point. In most cases, making the decision to enclose the rafters is more expensive than leaving them open because the additional trim that is required. In choosing an open rafter ceiling you will get a true original work of art in your space, and save a little green to boot! #5) Ceiling finishes – We have a huge demand for tongue & groove products, including beaded materials. 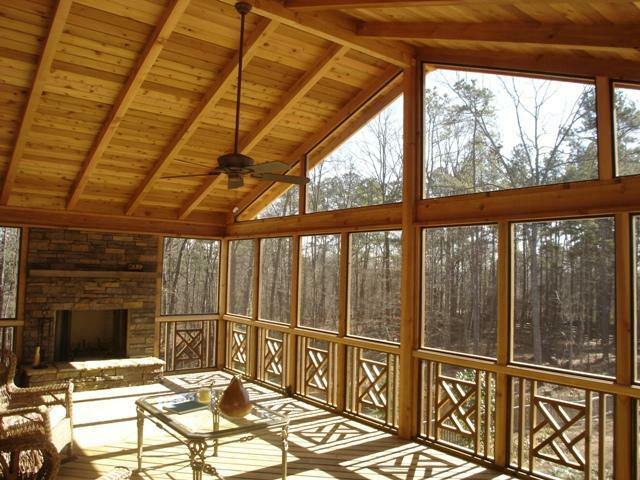 Among the most requested ceiling material for screened porches here in our region is cedar. #6) Fireplaces are hot! 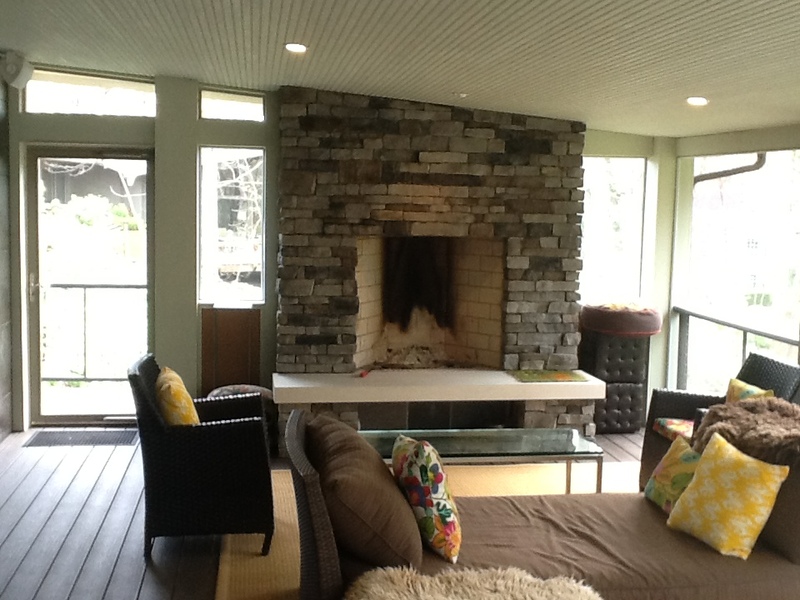 – Integrating an outdoor fireplace is hugely popular on our screened porch designs. Having an outdoor fireplace within your porch space helps create an atmosphere similar to an interior living room. Imagine being seated around the fire along with family and friends in a protected outdoor space that can be utilized throughout the year — magical. This type of magic can come with a hefty price tag depending on the type of outdoor fireplace you choose. Wood burning masonry models can cost $15,000 +, but gas inserts are also available which are a lot easier on the wallet. #7) Televisions – When it comes to electrical within your porch, Archadeck of Columbus always ensures our porches are wired for electrical. This includes outlets, cable, ceiling fans, lights and switches. We try to ensure no creature comfort has been overlooked. With those comforts in mind, having access to mount a flat screen TV within the porch interior is our most popular porch accoutrement and is requested by a vast majority of homeowners as the “must have” item for their porch. 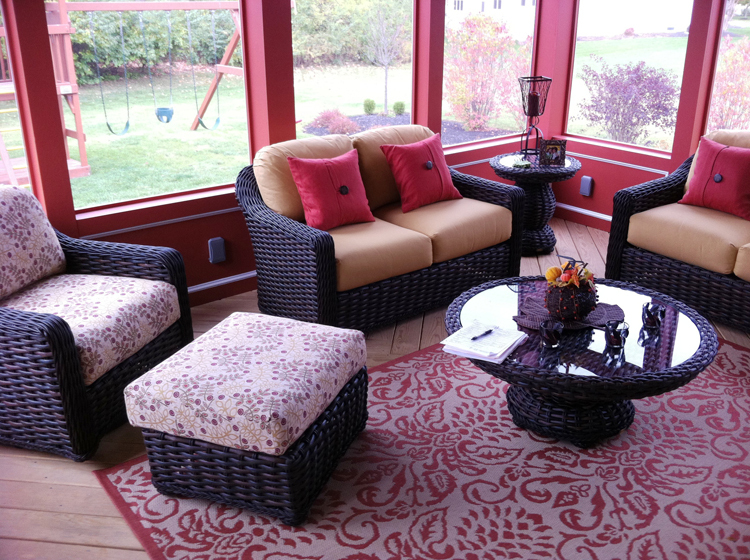 Notice the overstuffed, comfy furniture used on this screened porch in Columbus, Ohio. #8) Perimeter seating – This is especially the case with covered or screened patio designs. Many homeowners are requesting perimeter area seating with a patio, for instance, to use for dining and other recreational functions. The key to gaining the most function from your porch is to always consider what your main function of the room is going to be. This will ensure it is designed with that function in mind. #9) Porch furniture – We are seeing the use of larger-scaled furniture than of those used in the past in finishing out porch designs. Loveseats, couple chairs, and tables are often used alongside coffee and end tables to give the porch the feel of the ultimate outdoor room. We always recommend homeowners have some idea of the type, and scale of the furniture they plan on using in their space in order for us to design the space accordingly with plenty of turn-around room. #10) Totally custom – Each and every one of our porches is totally custom to what the homeowners want and need for their new space. The size, roof style, finishes, flooring, and ceiling treatment are done according to your specification. If you are starting to think about adding a new open porch or screened porch to your Columbus area home for the New Year give Archadeck of Columbus a call for a free consultation. We can help you plan and design an outdoor space that suits your individual function with a cutting edge screened porch or porch addition. You can see more of our stunning porch designs by visiting our screened porch photo gallery, and our porches photo gallery, located on our website.